"England is torn in civil strife as the Royalists battle the Parliamentary Party for control. This conflict distracts people from rational thought and allows unscrupulous men to gain local power by exploiting village superstitions. One of these men is Matthew Hopkins, who tours the land offering his services as a persecutor of witches." Although I prefer "Mark of the Devil" (1970), for the 18th day of my "Hallowe'en Countdown", I offer you the director's cut of "Witchfinder General" which I have embedded above. Back in the '80s, there was an unofficial novelisation of "Witchfinder General" in the series of pulp horror paperbacks published by Sphere and written by James Darke (a pseudonym for Laurence James) called "The Witches". I read those books long before I ever saw "Witchfinder General" for the first time and think they were rather good for what they were. For all of its merits, you see, "Witchfinder General" is a little bit tame in its non-director's cut version, and even with the gorier bits put back in, it's not exactly terrifying as a horror movie. 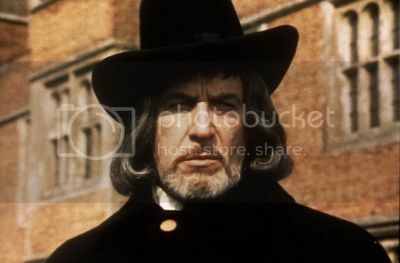 Where "Witchfinder General" does excel though is in how Vincent Price plays Matthew Hopkins without hamming the role up. It's quite a surprise to see that Vincent Price can actually act although the arguments on set between him and the director which caused such restraint are legendary. Vincent Price and Michael Reeves did not get on well together with Vincent being quite a primadonna considering that he wasn't even the first choice for the role. Originally, Michael Reeves wanted Donald Pleasance to play Matthew Hopkins, but Vincent Price was considered a better draw for American audiences. 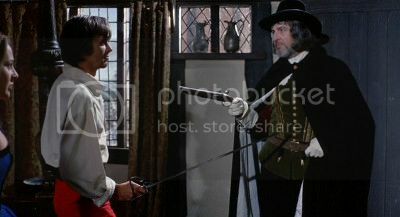 As much as I love most of Vincent Price's movies, I wonder what "Witchfinder General" would have been like without him. His American accent is a bit incongruous among all the British ones, and, of course, he's too old to match the historical Matthew Hopkin's age. I don't think anyone else would have looked right either except perhaps John Hurt, but he was hardly a big name in 1968. In the very late '70s, I was a huge fan of Ian Ogilvy as Simon Templar in the "Return of the Saint" TV series, and it's hard for me to get that later role out of my head whenever I rewatch "Witchfinder General". His Roundhead captain character, Richard Marshall, is too posh to be a "jumped up ploughboy" (as he is referred to in the script), but he's still fairly decent as a dashing hero whose life is torn apart. When I first saw "Witchfinder General" in the late '80s, I almost felt sorry for his character at times. Now that I'm older, harder and wiser, maybe not so much. Hilary Dwyer plays the love interest and the cause of most of the problems for Richard Marshall. If only Sara Lowes wasn't so "easy", she could have saved everyone a load of trouble. I found the scene where Sara offers herself to Matthew Hopkins to be far too hasty and contrived. She isn't in any real danger herself at that point, and there is no deliberating about it whatsoever. Having previously been fornicating in the Rectory with her future husband, she's no innocent. In many ways, what happens is simply the justice of "horror movie morality" being served. Highlights of "Witchfinder General" include spotting all the British talent who went on to mainly do TV work including Nicky Henson, Rupert Davies, Bernard Kay, and Wilfrid Brambell (most famous for being Albert Steptoe). It's also a rather unpleasant piece of nostalgia as not only did Michael Reeves succumb to a drug overdose a year later but Patrick Wymark (who has a cameo as Oliver Cromwell) died a couple of years later as well. "Witchfinder General" looks good, has a similar vibe to it as a Hammer production, but it isn't the most historically accurate depiction of 17th century England. The more eagle-eyed of you should scan the background for some obvious goofs including TV aerials. According to the records, the extreme torture methods such as those used by the Spanish Inquisition to extract confessions were rarely used in England, and witches weren't burned at the stake in the 17th century. That's not to say that there were never burnings, but it was a punishment reserved for treason. If a suspected witch confessed to treason as well, there would be grounds for a burning, but hangings were the easier, preferred, and most common form of execution. Even in the case of Guy Fawkes, who we Brits all remember with our "Bonfire Night" on November 5th every year, he was never actually burnt at the stake either but condemned to hang. Anyway, have a look at "Witchfinder General" for yourself, and let me know what you think about it in the comments section below.